Holidays are a great way to distance yourself from everyday life, and make the most of the time you have to unwind. There is nothing better than relaxing poolside with a nice cool drink and a book, not a care in the world...well, for a couple of weeks at least. However, within a month of being back in the office, you can’t stop thinking about when your next break will be. In fact, a recent study found that people who went on holiday were not always happier when they returned back to work, when compared to those that had not been away - showing that the time spent away was not used effectively enough to fully unwind. To help you make the most of your break, we’ve put together a list of simple tips on how to become more mindful when you’re on holiday. We have all been there on holiday, armed with a multitude of things to do and places to see - but with no real plan on how to squeeze them all in. You don’t want to miss out on anything but you can’t seem to pick the best options – will it be the catamaran boat trip or the walking food and wine tour? Well, all this unnecessary pressure translates into increased stress when you should be feeling at your most relaxed. A great way to combat this is to ditch the “to-do” list altogether! That’s right, ditch the plan. It sounds scary (we know), but you’ll begin to appreciate so much more of your surroundings, and it will prompt you to properly lose yourself, explore and live in the moment. A great way of practising mindfulness is to meditate. This should be a small part of your daily routine, and is no exception when on holiday. Unfortunately, going away can be a stressful time, and it’s all too easy to forget why you came away in the first place - to get some rest and relaxation, right? Meditation involves sitting silently and paying attention to thoughts, sounds, and sensations while breathing calmly. This helps to centre your attention whenever the mind starts to wander. 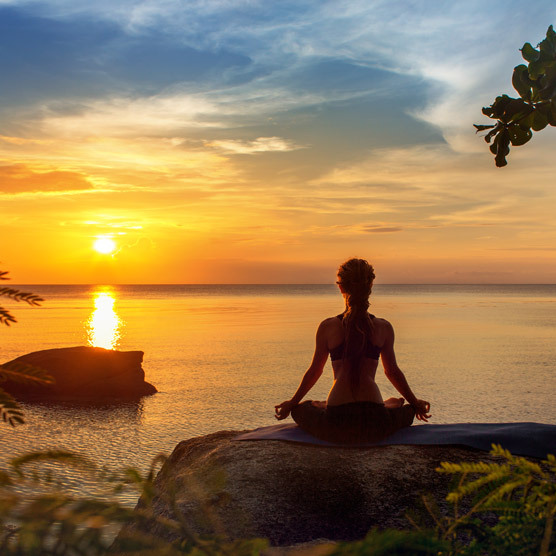 Yoga and tai-chi are also great ways to help with developing awareness of your breathing, and lucky for you, plenty of resorts provide sunrise sessions on the beach. This can be a very quick routine, and involve as little as 10 minutes a day. What’ve you got to lose? Nothing will tear you away from the present moment like being glued to your phone, scrolling through Instagram or trying to get to grips with your work emails while on holiday. A great way to focus on the moment and actually distance yourself is to take time out from social media. Although a great tool to connect with people digitally, you can quickly become dependent and begin to compare your life to others around you, rather than focusing on the real world right in front of you. Instead, explore the great outdoors in your new environment; maybe take a hike with your family, or go on a boat trip to find a secluded paradise island or traditional cobbled town. It’s natural to want to make the most of your time away and be present for every waking moment, but if it’s not an absolute necessity, try and refrain from setting that 6am alarm so you can watch the sunrise on the beach. Why? Your body is no doubt used to being woken prematurely by your alarm clock during your normal routine - breaking your everyday habits while on holiday allows you to give your body the rest and relaxation it needs, waking up when you’re ready to, instead of when you’re told to. The same applies for eating. We spend so much of our daily lives “playing by the rules”, or rather, swatting aside our wants and needs in order to prioritise other things. So what better time to splurge on that hot stone massage or a second poolside Pina Colada than when you’re on holiday… right? It’s time to treat yourself and indulge in some of life’s joys you wouldn’t normally allow when you’re in your daily routine at home. We’re not saying splash out and throw away all your spending money, but including one or two little luxuries is a healthy way to boost happiness and relaxation. Check out our top tips for how to combat stress while on holiday with psychotherapist Geraldine Joaquim. Finding acceptance and appreciation in what you do have is a fantastic way of being more mindful. A great way of doing this is to keep a list of things you’re most grateful for and to read it to yourself out loud. Whether it's spending quality time with your family on holiday, having new experiences, or even just the extra ten minutes in bed! This can even be incorporated with family and friends, by having each person say what they’re thankful for that day - perhaps even getting into a habit of doing this in the morning and evening while you eat. Wake up each morning and start your day by saying what you are thankful for, and read it back to yourself before you go to sleep that night. This will give you a clearer head and bring a feeling of positive energy to your holiday, helping you to make the most of each and every moment. Have you got any tips that help you to stay relaxed and mindful when away? Check back next week to see some first-hand advice shared by bloggers, influencers and industry professionals, and don’t forget to let us know yours over on Twitter. Plus, if you haven't booked your perfect retreat yet then check out our last minute deals online to put these tips into practice ASAP!